If your TIG / Plasma torch cables are getting damaged from being dragged over the floor or the expensive power supply to MIG wire feeder control cable needs protection - a Leather Cable Cover is just what the Doctor ordered, or is it the Vet?! Leather has unique properties that make it very abrasion resistant and resistant to welding spatter. It contains roughly 20% water which provides heat and spark resistance. Its fibrous tissue is made up of a protein called "collagen". The molecules line up end to end and twist together with others to form very tough fibers . The unique physical properties of leather come from the way in which these fiber bundles are woven together into a three dimensional network which extends throughout the bulk of the skin. WAT HCC leather cable covers are 4.0 inches wide and 22 feet long. KEVLAR thread is used to sew the leather parts. They are made from soft, flexible leather, ideal for TIG torches. 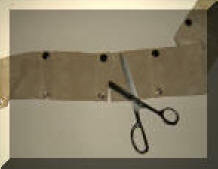 Snaps make it easy to install and add to its flexibility versus zippers or Velcro closures. They can also hold our patented Gas Saver System hose and a MIG wire feeder to power supply control cable up to 9/16 inches in diameter. Is 22 feet too long? Cut the WAT HCC to the length you need. Try that with a zipper! Not long enough? Snap two together end to end and cut to the length needed. Need to install on larger plasma cables? Want to include your 2/0 or larger power cable? Do you need to cover a primary power extension cable powering your welder or cover a spool gun cable bundle? Just snap two WAT HCC covers side by side to increase the width to 7.5 inches. Or end-to-end for any length! Need a 10 foot long cover, wide enough to cover your large Plasma Torch cable? Just cut our 22 foot cable cover in half and snap together side-by-side! If you need a 22 foot Double Width Cover, just purchase two and snap side-by-side. Need a longer cover? The WAT-HCC also has snaps located to allow connecting end-to-end for any length needed. Two cable covers snapped together side-by-side, are protecting a 9/16 inch diameter control cable, a 3/4 inch diameter 2/0 power cable or primary power cable extension and the GSS gas hose. "Oh, the Leather Cable Cover for my TIG hoses worked very well and fits perfectly. I'd just replaced them (the TIG hoses), but was looking for something to protect them that was better than the nylon wrap that's available around here. Now I'm "TIGing" again too, and much safer. It's good to know the coolant hoses are well protected. Much better than using a 300 amp TIG and then realizing that I was standing in a puddle of coolant, which is what recently happened. Can't pay the bills if I electrocute myself! Plama torches are expensive and when starting cuts or Plasma Gouging, molten metal splatter can destroy them. 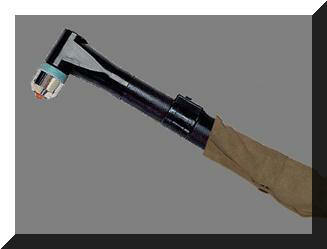 PLASMIT products have been protecting torches, an operators from possible shock, since 1988 - they're proven to work. These torch protectors are made from special high temperature materials that can protect the body from molten metal spray. 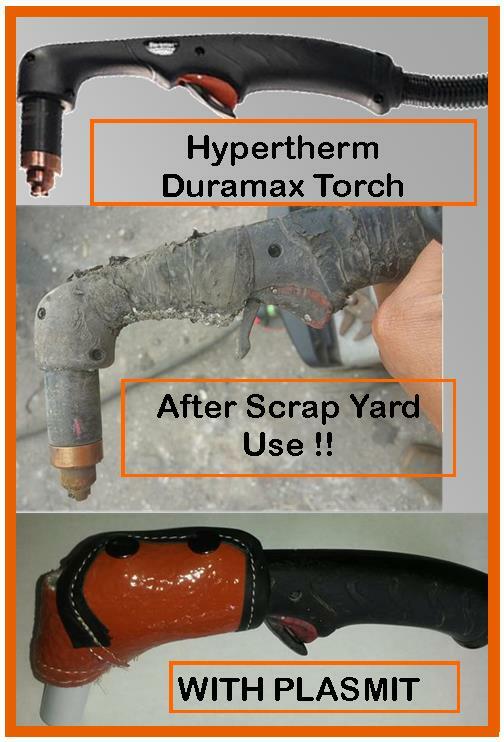 TOP: Hypertherm Duramax Torch used on Hypertherm Powermax 85, 100 and other power systems. MIDDLE: The same torch after use in a metal recycling business in Colorado that processes 100,000 tons/yr. After testing a prototype PLASMIT they ordered two more. BOTTOM: Hypertherm torch with PLASMIT installed. PDF Brief Plasma History & "It's Time for Plasma Gouging"
The PLASMIT Plasma Torch Protector is made from aviation grade, braided glass yarn, woven to produce a hollow sleeve and coated with silicone rubber. The edges are reinforced with leather. The material can withstand 500°F and molten metal splatter of 3000°F. It is an insulator, further protecting the plasma torch from a short circuit through the side of the torch body. Torch Protection –Guards the plasma torch body from radiant heat and metal splash: The silicone rubber coating reduces damage caused by rough handling and general usage. Safety: Plasma cutting systems operate at high voltage, and failures can be quite severe. Operator safety is enhanced by keeping the torch in good condition. DOWNLOAD "Time for Plasma Gouging"